by James O’Donnell PharmD MS FCP ABCP FACN R.Ph. The pharmacist dispenses 2mg warfarin instead of 5mg; the patient’s routine INR is non-therapeutic. The hospital notification system fails. The woman has a stroke and is permanently disabled. The pharmacist dispenses warfarin instead of Cogentin; the technician testifies pharmacist doesn’t check her prescriptions. The patient dies of an intracerebral bleed. Nursery infants are administered 50x overdose of heparin for catheter flush (the Dennis Quiad case). Babies develop bleeding. California Nursing and Pharmacy Boards investigate hospital practices. Floor stocking with 5,000 unit/ml vials instead of 10 or 100 is discovered. Texas Hospital reports heparin overdoses in several infants. Heparin syringes compounded in hospital pharmacy contained excessive amounts of heparin. Some infants died of heparin overdose. Doctor mistakenly writes 10 mg instead of 1 mg dose of warfarin. Pharmacist does not question the very high (almost never chronic) dose. Patient bleeds intracerebrally and dies. The patient is transferred from one hospital to another with Heparin infusion. First hospital uses 25,000 units in 500ml and the receiving hospital infuses a more concentrated infusion at first hospital’s infusion rate, resulting in massive hematoma, allegedly leading to sciatic nerve injury. A pregnant woman with a history of pulmonary emboli is non-compliant with enoxaparin treatment. The baby is born with a low birth weight; the placenta lost 25% of its blood supply. When the obstetrician was sued, his defense is non-compliance by the patient. Anticoagulants must be used in clinical medicine. The rate of death and illness associated with an arterial or venous thrombotic (clot) event (clot) is extremely high. In 1999, there were 529,659 deaths caused by coronary heart disease and 167,366 caused by stroke. Anticoagulants are used for the prevention and treatment of cardioembolic (clots in the heart) events as well as for venous thrombosis. Anticoagulant use has increased in the management of cardiovascular disease states due to heightened awareness of the mechanism of thromboembolism. 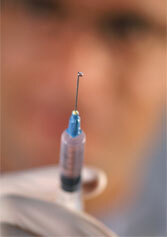 Anticoagulants are administered in oral or parenteral (injection) forms. The oral anticoagulant most commonly used, warfarin, certainly does not fit the mold when envisioning an ideal oral anticoagulant. It has a narrow window of safety. It requires routine monitoring and causes the patient to be at risk of bleeding. Monitoring warfarin therapy can be time-consuming for the healthcare professional as well as the patient. The ideal oral anticoagulant would be an agent taken only once daily with limited or no drug interactions, low risk of bleeding, no routine laboratory monitoring, and minimal side effects. Such an agent does not yet exist. Thrombin is the target for many of the newer oral therapies under development for prevention and treatment of embolic events. Inhibition of thrombin generation or its activity is an area of focus because it combines several steps involved in clotting. Heparin – the parenteral anticoagulant – is administered intravenously or subcutaneously. Unfractionated heparin (UFH), while commonly used intravenously, must be monitored closely due to the narrow therapeutic window, and has a significant risk of bleeding. Limitations of heparin use include heparin-induced thrombocytopenia (HIT), a paradoxical clot in blood vessels. Clinical use of heparin requires frequent monitoring with laboratory tests. Standard unfractionated heparin administration results in an unpredictable dose response. The activated partial thromboplastin time (PTT) is the most frequently used assay to monitor heparin’s effect. PTT results have traditionally been utilized to guide dosing of heparin during interventional procedures. With inhibition of thrombin, the PTT increases. However, the assay is far from perfect: the greatest problem is that it is not standardized among laboratories. Fractionated heparin, also known as low molecular weight heparin (LMWH) have gained popularity, have substantially less risk of HIT, and do not require the usual laboratory monitoring necessary with heparin infusions. These LMWH have replaced much of the subcutaneous prophylaxis therapy for deep vein thrombosis (DVT) prophylaxis for post-op and bed-ridden patients. Other limitations to heparin use include osteoporosis in patients receiving high-dose therapy for a prolonged period. Warfarin (Coumadin) is currently the standard for providing long-term oral anticoagulation for atrial fibrillation, prosthetic heart valves, venous thrombosis, and pulmonary embolism. There are several shortcomings to warfarin therapy. Under the best of circumstances when everything is done right, 10% of patients have adverse reactions or morbidity while under anticoagulant care. Frequent therapeutic monitoring is required due to the narrow therapeutic range and risk of bleeding associated with warfarin. Monitoring can be difficult because of changes in dietary vitamin K consumption as well as numerous drug interactions. Dosing must be specifically modified for the individual patient to avoid thromboembolic events caused by subtherapeutic levels as well as supertherapeutic levels, which lead to increased risk of bleeding. The dosing regimen may be complicated and difficult for patients to follow. A therapeutic response to warfarin is not achieved for 2 to 7 days. When rapid anticoagulant effect is needed, an additional form of anticoagulation such as heparin should be used. Evidence shows an exponential increase in the risk of thrombosis when international normalized ratio (INR) values fall below 2.0 and the risk of hemorrhage when INR values rise above 4.5. Thus, maintenance of a close target is an absolute necessity in monitoring patients on oral warfarin therapy. James O’Donnell PharmD MS FCP ABCP FACN R.Ph. Katie M. Greenlee: New Oral Anticoagulants. Journal of Pharmacy Practice 2002; 15; 369. Lodwick AD, Sajbel TA. Patient and Physician Satisfaction with a Pharmacist-Managed Anticoagulation Clinic: Implications for Managed Care Organizations. Managed Care February 2000. Vincze G and Parthan A: The Value of Home Monitoring Kits in Diabetes Mellitus, Hypertension, Asthma, and Oral Anticoagulation Therapy. Journal of Pharmacy Practice 2004; 17: 182-196.